≈ Kommentarer inaktiverade för Weekly Photo Challenge: Let There Be Light! My Adventsstjärna. One of the first Christmas decorations to come out of the box each year for Advent. Flag day in Sweden. In this case it’s Midsummer Day and my family is celebrating it out in my grandparents cabin by the river. 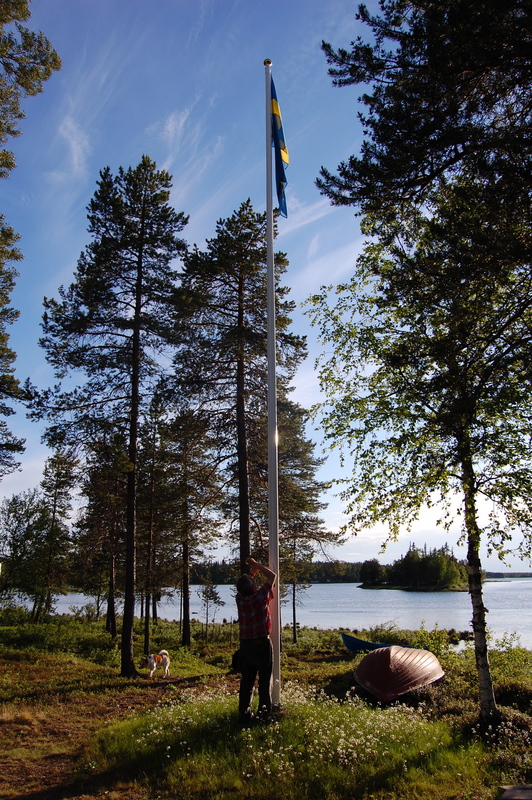 This picture is of my grandfather taking down the flag in the evening when the sun is setting. Well, setting further to the south that is. At this time of year the sun does not set at all in the north, it’s when we enjoy the midnight sun. This week’s photo challenge is Culture, and a hard one for me. I do think I spend to little time thinking about or experiencing culture. To see more pictures on the theme visit Weekly Photo Challenge: Culture at the Daily Post. Light is essential for us to be able to enjoy colors. This is a shot I took one morning during Balloons over Waikato in 2011. Some of the balloons lifted off just before dawn, using some type of gas to glow in co-ordinated patterns. It was beautiful! And really hard for me to photograph. But I think this picture can give you an idea of how it looked. For more pictures on the theme visit Weekly Photo Challenge: Color. I am a winter person, it’s a season I really feel at home in. It could have to do with me growing up in a subarctic climate, north of the arctic circle. We do experience a lot of winter there. And we experience a lot of light, in very different ways. From the midnight sun in the summer to the polar nights in midwinter. I’ve always been fascinated by the beauty of light. Wether it’s from the sun, a fireplace, a candle or something more modern. I love the delicate light of midwinter, the time of year when the sun won’t rise above the horizon for a full month. On a clear day the light is as crisp and cool as the air. Expect no warmth on your face but a wondrous scenery for your eyes. Ljus. Jag gillar ordet, hur det låter och hur det ligger i munnen. Fast det bästa med ljus är det skådespel det kan bjuda på för ögat. Det roligaste, men också svåraste, att fota är ljus. Att ta riktigt bra bilder, bilder med eftertanke, är svårt för mig. Jag ser något jag vill fota och så smäller jag bara av kameran, point and shoot liksom. Inställningar som tar tillvara på (eller tar hänsyn till) ljuset har jag väl aldrig tagit mig tid till. Ljuset är ändå snällt. Ibland behövs det inte så mycket mer än point and shoot för att jag ska få en bild jag tycker om. Jag är inte så kräsen.